In Baltimore, contractors have begun demolishing a symbol of the city’s renaissance and the mayor who sparked it, the McKeldin Fountain at Pratt and Light streets. 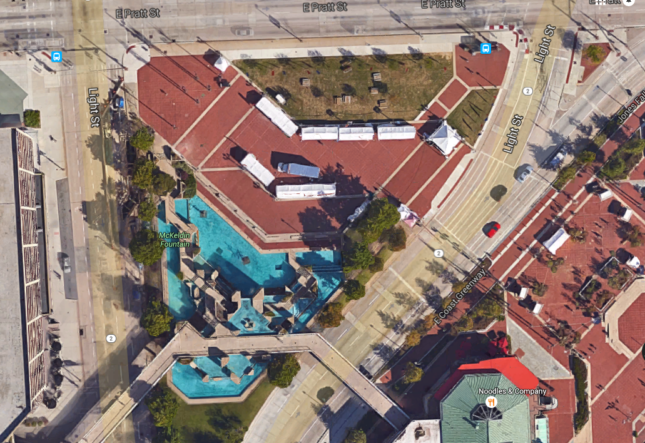 The Downtown Partnership of Baltimore has led the effort to tear down the fountain, named after former Mayor Theodore McKeldin, and replace it with a landscaped plaza that members argue would be a more welcoming gateway to the city. Members of Baltimore’s public art commission have questioned the demolition, saying they never agreed to de-accession the city-owned work, much less let it be torn down. But the city’s law department overrode them, saying the art commission serves only in an advisory capacity to the mayor, who supports the partnership and its demolition plans. Baltimore’s Commission for Historical and Architectural Preservation has not gotten involved in the controversy, saying the 1982 structure is not old enough to be considered for landmark designation or protection. Two pedestrian skybridges that were connected to the fountain were taken down more than a month ago. Last Saturday, crews with a spike-wielding excavator chipped away at the concrete piers on the fountain’s perimeter, reducing them to rubble. By the end of the day, the fountain appeared to be past the point of saving. Demolition activity is expected to continue on the triangular parcel through the month of November. After that, the Downtown Partnership plans to create a temporary park, which is expected to remain in place until funds can be raised for a permanent replacement. There has been talk about the city’s planning commission holding a design competition for the site, but no details have been disclosed. For now, Philadelphia landscape architect David Rubin has designed a temporary plaza after Ziger/Snead Architects and Mahan Rykiel Associates bowed out of the project. The Downtown Partnership is a private group supported by local businesses and its board meetings are not open to the public. 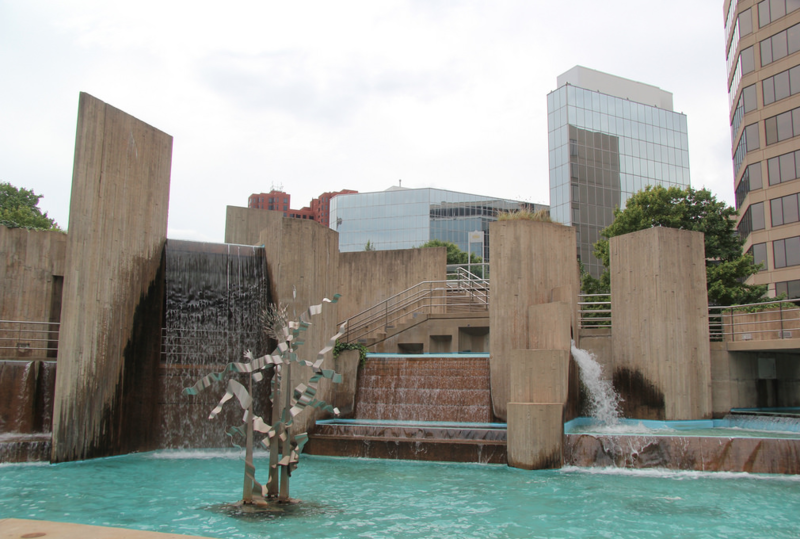 Its president, Kirby Fowler, has said that some of the immediate corporate neighbors of the fountain believe it is an eyesore and should be replaced with a more attractive gateway to downtown. Fowler several years ago led the effort to tear down another work of Brutalist architecture in downtown Baltimore, John Johansen’s 1967 Morris A. Mechanic Theatre. Board members of the Baltimore chapter of the American Institute of Architects have said they believe the McKeldin Fountain shouldn’t be razed until the city has approved a design for its permanent replacement and funds are in hand to complete construction. Fowler has said he wants the fountain gone as soon as possible, even if the partnership doesn’t have funds for a permanent replacement. The timing is also affected by the pending departure of the current mayor, Stephanie Rawlings-Blake, who is leaving office in December after deciding not to run for reelection. Voters will determine her replacement next week. The way the project has been handled has drawn criticism from members of the arts and design community, who contend the general public never had any real say in the demolition or what will replace the fountain. “This is a victory for false nostalgia, fear of the future of the public realm, and the expanding mandate of government and design by nonprofit corporations instead of people,” lamented Fred Scharmen, a Baltimore architect and educator who has questioned the demolition and the lack of transparency in the decision-making process.